Star Trek: The Next Generation is the most popular, longest-running series in science fiction history. Now, after the spectacular worldwide success of Star Trek: First Contact, Captain Jean-Luc Picard and the crew of the Starship Enterprise return to the big screen in a thrilling new adventure that captures all the fun and excitement of Star Trek at its best. Star Trek: Insurrection reunites the hugely popular crew of Star Trek: The Next Generation: Jean-Luc Picard, Starfleet's finest officer; Commander William T. Riker, his stalwart first officer; Lieutenant Commander Data, the indispensable android; Commander Deanna Troi, the empathic Betazoid counselor; Lieutenant Commander Worf, the fierce Klingon warrior; Lieutenant Commander Geordi La Forge, chief of engineering; and Dr. Beverly Crusher, the ship's able medical officer. Together, they have faced many challenges over the years, but nothing has prepared them for the unexpected crisis that tests both their skills and their convictions. On an unnamed planet in a distant sector, Starfleet, in an uneasy alliance with a mysterious new alien species of unknown origin, has discovered a secret with astounding implications that could transform the future of the entire Federation. But this secret has a price that may be more than some are willing to pay. The secret first turns Data against Starfleet, then draws Jean-Luc Picard and the Starship Enterprise into a tense and dangerous situation that has unexpected effects on every member of the crew -- and presents them with an agonizing moral dilemma. Faced with orders he cannot obey and a crisis he cannot ignore, Picard finds himself torn between his conscience and his uniform. Bestselling author J. M. Dillard has written a powerful and exciting novel based on the major motion picture directed by Jonathan Frakes ("Commander William T. Riker"). 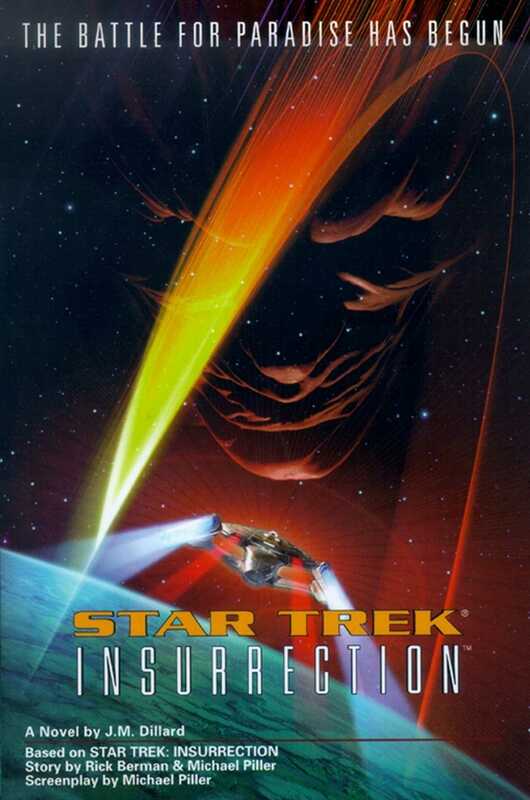 Star Trek: Insurrection is sure to delight audiences throughout the world.